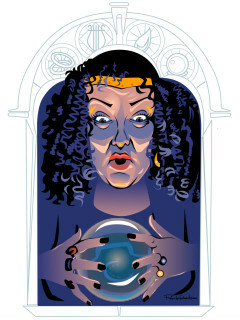 In The Medium, Madame Flora holds a séance and invites her guests’ dear departed children to speak to them, and they do. It’s all a sham, but when threatening, un-staged events occur, the medium becomes afraid, and suspects those around her. Add too much alcohol to this situation and in true operatic fashion, someone has to die before the curtain falls. Technology can be a distraction where matters of the heart are concerned. Ask anyone whose lover’s attention is continually on her smartphone, and not on him. In The Telephone, Ben can’t connect with Lucy until he wisely uses the technology she favors. These two mid-twentieth century compositions by Gian Carlo Menotti make an ideal double bill.